The following pages will analyse and compare American realist Edward Hopper (1882-1967) and German contemporary realist Tim Eitel (b. 1971). The works selected are Office in a Small City, painted by Hopper in 1953 with oils on canvas, and Ohne Titel (Ausblick)/ Without Title (View) by Tim Eitel in 2002 with acrylic paints on canvas. Both artists portray loneliness, and share a common theme of isolation. This was conveyed in my fifth studio work, which is a semi-realist painting of a childhood photograph of me after my family and I moved to the United States from Germany. The event influenced my identity to a large extent, and I wanted to convey the isolation I felt. Therefore, I used similar techniques as Hopper and Eitel, mainly in terms of composition, tone, and shading. Stated to be one of the most prominent American artists, Hopper depicted realist urban and rural scenes of post-war American life, and rendered his personal vision of it. Born in 1882 in New York, Hopper studied illustration at university, though shifted to fine arts and was drawn to oil painting. He was heavily influenced by Edgar Degas and Èduard Manet, particularly their use of compositional devices and their depictions of modern urban life, which is apparent in his works. The height of Hopper’s fame was achieved through his oil painting Nighthawks (1942) which renders weariness, concern, and tension of customers and a waiter in an urban, anonymous diner in the depths of the night. Like many of Hopper’s works, it is believed to echo wartime anxiety and uncertainty through the sense of isolation produced through Hopper’s use of composition. This theme of isolation is apparent in Hopper’s later works as well, such as Office in a Small City (1952, oil on canvas, 71.1 cm * 101.6 cm). Arranged in a minimalist composition, the work depicts a man looking out at urban architecture and cityscapes. He seems isolated both physically and emotionally. Through the two large and open windows which almost seem to have no glass, the viewer can see in and out of the office. The figure is staring out of the window, and does not seem to be actively working, and instead perhaps waiting for something or daydreaming. He is the only figure in the piece and is detached from unseen possible co-workers. This triggers the sense of physical isolation. In the cold environment of a corner office which contrasts open windows and a blue sky, the man seems trapped, which furthers his physical isolation. Furthermore, he is framed by the office windows, and his head is profiled towards the windows and the wall of buildings beyond, which suggests containment within his environment. The figure is staring detachedly outside towards the nearby buildings and brilliant blue sky, perhaps with something akin to yearning of breaking free of the physical boundaries set which trigger his isolation. There is no indication of any particular profession, and the viewer cannot see any details of his face. The office features bland, mass-produced office furniture and the white walls indicate a similarly bland building. The anonymity, facelessness, and sombre solitude of the figure could be representative of Hopper’s criticism towards post-war American business culture, as the man seems to be trapped by the boundaries set by his workplace. Therefore, Hopper could be criticising the surge in post-war American capitalism and perhaps the isolating effect this had on ordinary workers such as the figure portrayed. Furthermore, there is a strong contrast between the stark, utilitarian appearance of office building and the decorative, false front of the building opposite. This could indicate Hopper’s ambivalence towards modern urban life which is demonstrated in his other works which also portray modern and urban American society. The subject matter of the piece is the common features of post-war American life and of its inhabitants, which was commonly portrayed by Hopper. In terms of visual properties, Hopper uses light, shadows, and cold colours to increase sense of loneliness, as well as an ambience of a mass produced and industrialised environment. The building itself is of bland design with large windows, which seem to trap the figure and is also an almost surrealist element, seeing as it is possible that the room has no windows at all, as there is so visible indication of glass. The stark, pronounced and parallel composition furthers the clean lines of the work. A sense of unity is produced through the solid grey colour of the wall, and the strong shade of blue of the sky. The overall technique and style of the piece is simplified realism, demonstrated through the clear and pronounced shadows and strong tones that have little variation. Hopper himself states that his “aim was to try and give the sense of an isolated and lonely office interior rather high in the air, with the office furniture which has a very definite meaning to me.” (metmuseum.org) He did not further state what “definite meaning” this was, yet as the office furniture is bland, plain, and mass-produced, one can assume that Hopper wished to further the idea of an isolated, melancholic and lonely worker confined both literally and physically by his environment, be it his work specifically or the larger society of post-war America. Produced in 1953, the society Hopper lived in during the time the piece was made experienced great change. The post-war economic boom caused the United States to become increasingly materialistic and capitalist, which triggered a large expansion of the middle-class and people who worked in large organisation, such as offices as portrayed in the piece. This shift of working in a more familiar, smaller environment to working in a large business as a mere employee, similarly to a cog in a machine. Furthermore, previously small industrial cities grew massively during this time. Therefore, one would have often felt isolated, which could be a possible reason why Hopper chose to portray the worker as physically and mentally isolated and distant. Hopper used emblematic and anti-narrative symbolism to convey this. The work depicts isolation and loneliness of man in a uniquely stark fashion, which could be representative of post-war American consumerist and capitalist society through depicting an anonymous working man trapped in a confining and isolating environment. In another sense, it is important to note the context of the work. Painted in the 1950s, the piece features a reductive style, which is defined by clear lines, reduced formed, streamlined composition, and a clear composition. This style opposed abstract expressionism. Also a post- war movement, abstract expressionism sought to create works fuelled by the subconscious. Painting was seen as an automatic and spontaneous action. Hopper’s realist style is in direct opposition to the works of Pollack and Rothko. Unlike prominent artists of the time, Hopper did not paint freely. Due to this, Hopper was often labelled as passé old fashioned. Post-war, Hopper’s success gradually declined, yet, he continued to work. His paintings remained carefully planned with an eye for composition. He continued to interpret American life with very little dramatics. His staged scenes seem ordinary, with isolated, frozen figures in almost awkward poses. Whilst other works at the time were lively and abstract, his pieces remained monotone, yet authentic. Hopper removes any superfluous details, and indeed, this authentic and uneasy realist style captivates and resonates with the viewer, even decades later. Born in 1971, German contemporary artist Tim Eitel is one of the most prominent realist painters of the twenty-first century in the European art scene. Eitel studied German language, literature, and philosophy before studying painting at university, resulting in his solo-debut in 2006. Eitel’s primary medium is oil on canvas, with which he creates minimalistic scenes in a realist style with a sense of abstract composition. Eitel is best known for depictions of a somewhat altered and staged reality, and especially his choice of background and composition are often abstract and, in a sense, surreal. This can be seen in his work Ohne Titel (Ausblick)/ Without Title (View) (acrylic on canvas, 2002, 30 cm * 30c cm). The piece shows a man staring out into a forest, perhaps standing before a window or door of some kind. It is not en-face. Dark blue borders surround a landscape of a forest. The interior has a Mondrian-like aspect through solid blocks of colour; mint and dark blue. It is unsure whether these are windows or doors, or a surrealist element of the piece. The man is alone, and gives a sense of solitude. 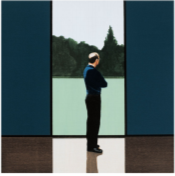 The composition of the work- with the reflection of the figure on the floor and the man gazing out into the distance- reiterates the reflective nature of the work, as well as the loneliness portrayed. The thick, dark blue borders around the man create emphasis on the figure and isolate him physically. Mentally, the figure seems isolated in that we cannot see his face, and he is simply staring out into the distance. He is not interacting with the viewer, which creates a cold detachment. The dark borders seem to trap and constrain the figure, giving the work a somewhat surreal and ominous aura. The man, however, does not seem to acknowledge the borders, and instead stares longingly outside towards the forest, perhaps in an effort to escape this isolation. The environment is cold, an effect created through the cold colours used of white, light green, dark green and dark blue, which furthers the sense of isolation and creates unity through tone. It also highlights omnipresent solitude, and creates an ambiguous environment. The figure could be anywhere; inside or outside. Eitel’s technique of realism is very minimal and taken-aback. It seems to be ‘boiled-down’ to clean lines and shading. He chooses to paint some features in greater detail, such as the man’s head, in which he has striking variations of tone to create a lifelike quality. In his technique, he creates a contrast between the soft, light and varied tones of mint green of the forest and the harsh, manufactured, artificial dark blue border with no variation in tone. In the work, the man is in the focal point, and is accentuated through the contrast of light and shadows, as well as composition. He is placed in the centre of the square work, and surrounded by the dark blue borders. This theatrical and staged composition, with elements of surrealism and the unreal, are typical to Eitel. Through his realistic technique, the contrast between the real and staged is particularly effective. He seems to question how much of our true reality is staged through his inconspicuous depictions of ordinary and everyday scenes, which could have been imagined or real. The subject matter portrayed is a single man staring out into a forest. Eitel uses minimalist and cold tones to further a sense of isolation. The stark and thick borders of solid colours physically isolate the figure. Eitel has explained that he does not “want to tell stories”. There is little narrative element to the piece, yet it is powerful nonetheless. The solitude and isolation portrayed is chilling, which is furthered through the figure’s detachment and lack of interaction with the viewer. Whilst there is no direct criticism to a larger idea or a clear narrative, the work depicts the solitude, loneliness, and isolation of man. Whilst Eitel is a famous, up-and-coming contemporary painter- particularly in Europe- the work Ohne Titel (Ausblick)/ Without Title (View) is not his most famous work, yet it accurately portrays Eitel’s signature features. Realism traditionally portrays scenes truthfully and without artificiality, yet Eitel’s pieces have an ominous aura of mystery. They question the viewer’s idea of what is real and what is not through combining stylised and abstract environments and compositions with realist figures. A contrast between reality and staged theatrics can be seen in most of Eitel’s work. In another sense, Eitel’s work contrasts other German contemporary art pieces. As a realist, Eitel stands in opposition with surrealist realists such as Neo Rauch or the abstract works of Arno Rink. Specifically, Eitel distances himself from the prominent Neue Leipziger Schule, established in the 1970s. Students of the school were predominantly working with figurative and abstract elements. Eitel, however, is distinctly realist, and his paintings are more reminiscent of photographs in their clean composition, tones, and composition. Hence, Eitel’s pieces differ greatly from those of other key contemporary German painters. In another sense, both works are connected in that they feature different contrasts. Eitel contrasts the light tones of the forest with the harsh borders, whereas Hopper contrasts the modern and bland architecture of the office building with the decorative façade of the older buildings and the bright blue sky. Hence, both works could be said to contrast man with nature, or man-made buildings with nature, setting up the dichotomy of contextually modern inventions with nature. Furthermore, both pieces depict a man’s loneliness, yet Hopper comments on post-war American society, whereas Eitel does not critique a larger idea. Hopper’s piece has great contextual importance as it explores the loneliness of post-war American society and of an ordinary, working man. Therefore, one could say that Hopper’s work has a greater cultural significance, and it is also far more famous. However, the striking mysterious solitude portrayed in Eitel’s work could be seen by some to have a similar critique on today’s society; questioning the isolation of man in the twenty-first century, perhaps through modern technology which is often described to isolate. Critically, both artists stage situations and events. Their compositions are both rather similar, and feature repetitive elements in terms of perspectives and lines. Both Hopper and Eitel show figures in almost awkward poses in eerie compositions, free of any superfluous detail. In a way, both works are reminiscent of observing specimens in a jar, particularly the isolated, lonely man, thus making the two pieces powerful and resonating with the viewer. My own studio work is connected to Eitel in terms of technique, method, and his concept. In my work, I wanted to convey isolation, as I painted a childhood photograph of me, taken a few days after my family and I moved to the United States from Germany. Similarly to Eitel, I examined the relationship between the figure and surrounding space, and created a cold and empty atmosphere and environment, symbolising the loneliness and isolation I felt. The ambivalence and artificiality of the space reiterates the personal emotions I felt at the time, which had a strong influence on my personal identity. Eitel’s technique influenced me in that I, too, used borders to reiterate the physical and mental constrictions and isolation I felt. The borders added depth to the work in terms of perspective. Through replicating Eitel’s minimalist style- almost like a field painting- and heavily reducing the colours, I further the isolation and loneliness and due to the col environment, the disunion between my childhood self and the empty space is deepened. Lastly, similarly to Eitel, the figure is staring into the distance and surrounded by a desolate environment, seemingly staring into infinity. This creates an uneasy feeling with the viewer, and thus echoes the emotions I felt at the time. Similarly, Hopper influenced my studio work in that Hopper’s imagery, too, is very restrained, and shows disconnected and isolated figures. Through Hopper’s use of light and composition, an almost awkward tension is created, which I replicated through the solitary figure in my work looking to the right, with a stiff posture and serious expression. The dramatic lighting highlights the isolation I experienced, and especially reflects the emotions I felt. Thus, both Hopper and Eitel work hand in hand to reiterate the message of my piece. "Edward Hopper and Tim Eitel Comparison." UKEssays.com. 11 2018. All Answers Ltd. 04 2019 <https://www.ukessays.com/essays/arts/hopper-eitel-artist-comparison-6150.php?vref=1>. "Edward Hopper and Tim Eitel Comparison." All Answers Ltd. ukessays.com, November 2018. Web. 23 April 2019. <https://www.ukessays.com/essays/arts/hopper-eitel-artist-comparison-6150.php?vref=1>. UKEssays. November 2018. Edward Hopper and Tim Eitel Comparison. [online]. Available from: https://www.ukessays.com/essays/arts/hopper-eitel-artist-comparison-6150.php?vref=1 [Accessed 23 April 2019]. UKEssays. Edward Hopper and Tim Eitel Comparison [Internet]. November 2018. [Accessed 23 April 2019]; Available from: https://www.ukessays.com/essays/arts/hopper-eitel-artist-comparison-6150.php?vref=1.